Over the past ten years or so, I’ve been involved in one way or the other in the arena of assessing quality in Online Learning. It was 2004 that I first learned about the work being done by QualityMatters during the first year of their FIPSE grant. As the Dean of Distance Learning at a Minnesota College at the time, I attended the ITC eLearning conference and brought back version one of the QM rubric. At a faculty retreat that spring, the online faculty at my college decided that they wanted to revise the rubric for local considerations, create their own faculty-driven review process, and pursue a voluntary quality review process for online courses at the school. That process at the college is still going strong now 10 years later, even though I’m long gone. During my time as an independent e-Learning consultant, I received several contracts to work with colleges on their e-Quality initiatives and for accreditation for online programs. I’ve had first-hand experience with many different schools and have examined what they are doing (and what they are NOT doing) with regard to assuring and/or increasing the quality of their online education offerings; including courses, programs, and student services. In other words, I’m neither a noob nor a rube when it comes to e-Learning quality. As I continue to find new developments in the e-Quality world for my Scoop.it page on such, I continue to be amazed at how little there is that is new in this field. Mostly the same old conversations about the same old issues. Does that mean that we’re done here? I doubt it, but not quite sure what else to make of it. There are several things that continue to bug me about the conversations around e-Quality. In this post I’ll mention the first two things that are bugging me. More posts will follow shortly until I’ve sprayed all the bugs (or just run out of things that bug me). To the best of my knowledge, we still don’t have a widely accepted definition of what we mean when we use the term e-Quality (my term for e-Learning Quality, Online Course Quality, Distance Ed Quality, etc. etc.) Heck, we can’t even agree on the term that we use when referring to it. The word ‘quality’ itself is not that muddy: “a high level of value or excellence” says the online Merriam-Webster dictionary. But specifically, what do we mean when we refer to quality in an online education setting? Excellence in e-Education includes high expectations for all parties involved, clearly communicating standards upon which evaluations will be based, gathering and reporting qualitative measurements of student learning achievements, while operating efficiently and providing good value for the costs incurred by all stakeholders. The almost-singular focus on course design is seriously misplaced. Some of you are probably familiar with this diagram I developed about 6 or 7 years ago. 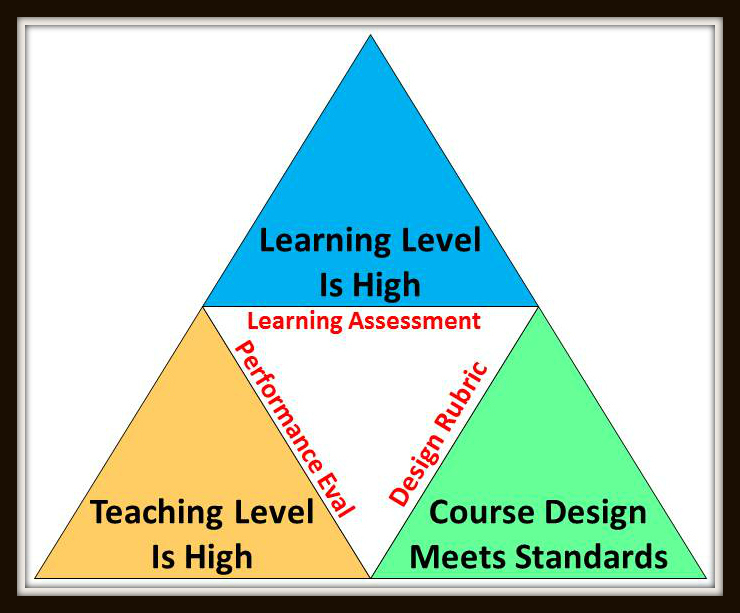 The three triangles indicate three potential areas of assessing “quality” in online education, specifically at the course level. My mantra during the past has been that there is an unbalanced focus on the lower right triangle with little, if any, attention being paid to the other two triangles. I have noticed a slight uptick in the attention paid to the quality of instruction and the quality of student learning achievements, but those areas still pale in comparison to the focus on course design. Most people believe that if they have a QM (or QM-like) rubric and process, then they’re answering their critics’ questions about online course quality. 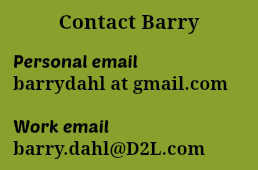 Those of you who’ve heard me speak on this matter know that I consider the course design to be several magnitudes of lesser importance than the other two areas. 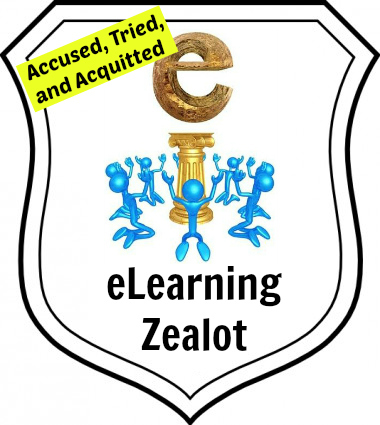 In fact, if you can provide solid, repeatable evidence that the online students are achieving the intended learning outcomes at a very high level – then I’d be willing to throw out the other two altogether. That’s rarely the case. Let me restate that: if your online students are learning what they are supposed to learn, then I’d rather not dictate certain teaching techniques or course design standards, because what they are doing must be working. It’s nice to have evidence of all three – as long as your use of a design rubric doesn’t become a one-size fits-all approach. My suggestion is that you focus on gathering evidence for the blue triangle. If that evidence is weak, then look at the other two triangles to identify potential causes (there are other potential causes, of course). If the evidence of success in the blue triangle is strong, don’t worry so much about the other two. I’m just getting started. Check back soon. I cannot agree more. I will be careful what I say publicly, but I have a hard time agreeing to participate in projects that I don’t completely agree with involving course quality because I know that design is just a small portion of a quality online course. Interesting read. I agree on the misplaced focus on course design. While it is important, the other two triangles need attention too. The first metaphor that came to mind was a high performance car. It can be engineered to top standards and best designs for safety and performance, but if the driver is not skilled or prepared the vehicle will not achieve it’s potential. (Think of the yellow Lamborghini with an impaired Justin Bieber behind the wheel!). This thought took me to consider the role of your yellow triangle. How much weight should there be on that leg to ensure quality? Again, a vehicle metaphor: the driverless car. One of the big pitches for pursuing autonomous technology is increased safety and capacity. The driver becomes a rider, not actively involved and the technology allows more cars on the roads with fewer accidents. It’s no coincidence that Sebastian Thrun is the impetus behind the driver-less car and the MOOC movement. Focusing attention on the design and scale of online courses in a way that marginalizes the instructor (driver) would seem to allow more learners to achieve higher outcomes. That is one thought of expanding e-learning that fades the yellow triangle and tries to get the table to stand on two legs. Perhaps it can. I’m looking forward to the next set of bugs!